The current Biggleswade United were founded in 1959, although records exist of a previous club under the same name in the 1920s. Initially, the club joined Division 3 of the North Hertfordshire League, before joining Division 1 of the South Midlands League in 1969. In the late 70s and early 80s, Biggleswade United had several seasons where they finished bottom of this league, before dropping back into the North Hertfordshire League (this time in Division 2) in 1984. Two seasons later, the club switched to the Bedford & District League, where they won Division 2 in 1991 and then went on to win Division 1 in the following season. The club then won consecutive Premier Division titles in 1994/95 and 1995/96 to earn promotion back to the South Midlands League. The club won Division 1 in their first season back at that level, earning promotion to the Senior Division of the newly-formed Spartan South Midlands League; this was later renamed to Division 1 in 2001. In 2004/05, Biggleswade United finished 3rd in Division 1 to earn promotion to the Premier Division, where they have remained ever since. In 2014, Spanish football journalist Guillem Balagué became the club's Director of Football, which has allowed the club to attract some notable players, including former Espanyol and Chelsea midfielder Enrique de Lucas. Biggleswade United have experienced limited success in FA competitions. Their best run in the FA Cup has been to the 1st Qualifying Round, which was last achieved in the 2016/17 season, when the club beat Newport Pagnell Town and Aylesbury United before losing to Hitchin Town. In the FA Vase, the club have only ever made it as far as the 2nd Round, which was also last achieved in the 2016/17 season: the club beat Whitton United, Woodbridge Town and Baldock Town before losing to Sun Sports. 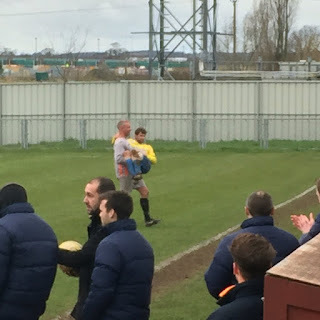 For my second proper groundhop, my visit to Biggleswade United came about when I noticed that they offer free admission to their league games for anyone who is a season ticket holder at any of the 92 Football League clubs. So, as a season ticket holder at Norwich - and with Biggleswade being just half an hour away down the A1 - I decided to take them up on that offer and pay them a visit. I don't particularly remember much about the game - and I can't find a match report online either - but I do remember that it was very windy and this massively influenced the game in terms of the lack of quality on display. Biggleswade United took the lead in the first half, then St. Margaretsbury equalised before a clever team move saw Biggleswade reclaim the lead. Second Meadow is a fairly typical Step 5 ground in terms of the amount of football furniture available, but unlike most the two stands are at least different to the increasingly-common Atcost stands that so many clubs at this level use. There is one stand on the far side which contains a mixture of seating and standing, which probably has an overall capacity of around 100. The main stand - known as the Steve Matthews Stand - is on the other side of the ground and contains seating for 260 people, with a small area in which it is possible to stand. Other than this, the rest of the ground is open hard standing and, as it stands, with little room or potential for expansion should the club ever climb the leagues. The ground has an overall capacity of 2,000, with the record attendance being 303 for a league fixture against AFC Dunstable in January 2016 (just a month before my visit, in fact).